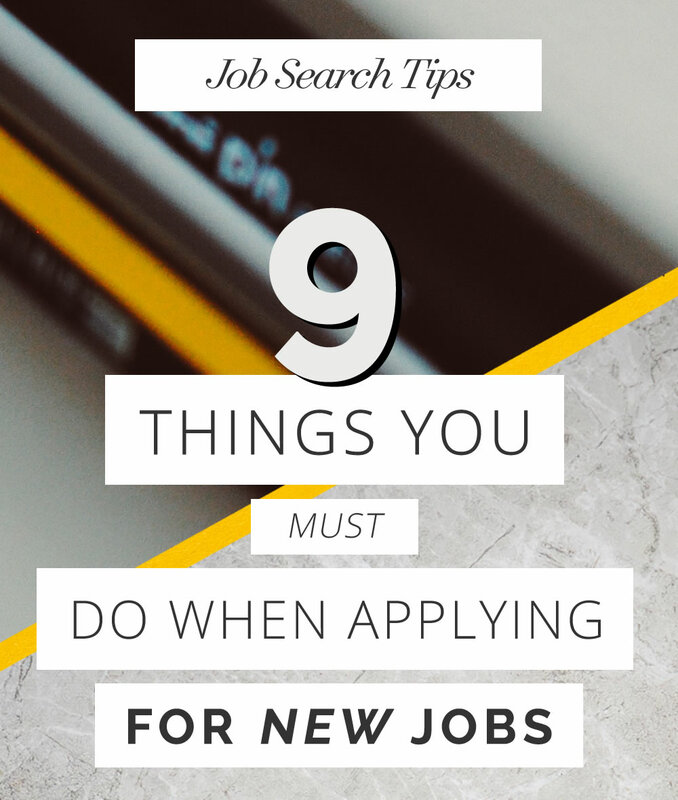 When applying for new jobs there are a few simple things (9 in fact) that you absolutely must do in order to be prepare for your job search and give yourself the best chance of success. Job hunting is ultra competitive therefore an organised and streamlined approach will help you stand-out, be professional and achieve more interviews. In a recent Career Builder Survey 70% of employers check the social media profiles of candidates before they conduct interviews. If an employer has taken the time to review your social media channels then your CV / Job Application must have sparked interest (they wouldn't take the time unless they saw something in you). Therefore you are 90% of the way there to getting that interview. Employers conduct social media checks to look for additional information that supports qualifications for the job and whether candidates demonstrate a professional online persona. TIP: Within LinkedIn check "who's viewed your LinkedIn profile" to see who's been snooping. You can connect with interesting people and follow up job applications directly with decision makers. Following the advice of David Ogilvy (What David Ogilvy Can Teach Us About CV Writing) he highlights the importance of getting your copy proof read - “If it is important, ask a colleague to improve it”. How many job adverts have you seen with the words "This role requires attention to detail"? Employers don't want slap dash candidates that are likely to make mistakes. A typo in a CV is basically telling the employer I don't check my work. We've all been found guilty of making obvious mistakes, cut these out by getting a colleague to proof read your CV doc. Paid by the hiring company on the successful placement of a candidate (who stays working with that company for a minimum of 3 months), they work for the company (not you), they are obligated to fill that position and will do what they can to achieve this, and if you get a job through one, they will do what they can to ensure you stay (so they get their fee). Put simply, Recruitment Agents are salespeople - don't be fooled into thinking that they have your best interests at heart. They earn a fee (normally a big one) based on a percentage of your annual income. The best ones are highly skilled in negotiation and persuasion, and can use a plethora of tactics to manipulate the hiring process. When giving career counselling I typically advise job seekers to write down their core reasons for changing jobs before actively applying to positions, you can then be upfront with agents from minute one and cross check this criteria with each position you are applying for. Be true to yourself and don’t get pushed into something you might regret down the line. TIP: It is a legal requirement for a Recruitment Agency to inform you of where your details get sent. Watch out for this and make sure you obtain hiring company names and details. // Whether you intend to search for jobs whilst at work or plan on burning the midnight oil - organise your time and don’t get caught by your current boss! As the saying goes fail to prepare, prepare to fail. Track all applications, interviews and contact details in one place, understand what jobs you are applying for and when you apply for them. Work to a process, log dates of when you applied to jobs and follow up with regular emails and phone calls to track progress. We've put together the following Job Search Planner (Printable / MS Excel Download) to help keep things in order. You can save key information like contact numbers, names, salary, location, application dates etc. – when the phone rings this will become your go to bible! // Make yourself available quickly for interviews, employers REALLY appreciate keenness and enthusiasm. Once in progress a typical recruitment process can be completed within a matter of a few days, so if you get that call asking for an interview, move mountains to make it happen as soon as you possibly can. Also, consider the competition (i.e. other candidates), if you make yourself available and interview ahead of them that gives YOU the advantage. Employers receive hundreds of applications from prospective candidates, therefore if you want your CV to be seen (or at least get a longer look) then you need to make it impactful. A 3 page Times New Roman doc just ain't gonna cut it anymore. Resume templates come in a variety of different designs, colours, layouts and styles therefore choosing the one that best suits your career history and personality can be a challenging task. In 9 Resumes that will take your career to the next level we’ve put together a collection of our favourite resume designs and highlighted which professions they are best suited for. Also, be sure to check out all printable and downloadable CV Examples. // It might not all be plain sailing so be prepared for the low points. Rejections are part of the process just stay positive and focused and learn along the way. Ask questions to gauge feedback on your CV and interview performance so you can leverage this going forward. Always approach the job search process with a positive "I Can Do This" attitude. I've found books like The Morning Miracle by Hal Elrod as great motivators and helpful when going through change in life - a positive outlook can really focus the mind. // We touched upon this lightly in point 3. But as part of your criteria setting exercise you need to fully understand your salary requirements. It still surprises me to this day how many candidates enter the job market without fully understanding what their minimum salary expectations are. It can lead to some very awkward situations at the job offer stage when a candidate declares they want more than the job is paying! Build a true picture of your minimum salary requirements, factor in things like commuting distances, additional child care, moving costs, etc. – crunch some numbers and do the research before applying to jobs! Understanding this from the start will avoid a lot of wasted time later. // Often overlooked, this can be the key to opening the door. The cover letter gives you the chance to explain WHY you are suitable for an open position, but don't make the mistake of using the same cover letter for every job application. You need to target the Cover Letter to each job application and highlight why you want to work for the employer. A one size fits all approach will not work here, and can have the opposite effect. I know what you're thinking - "that is going to take me ages" - granted, it will take you longer, however your approach to job hunting should be a small amount of high quality, targeted applications that lots of random approaches where your details just don't match up. All these CV Templates come with matching Cover Letter Designs.